Ray Foxx is back with a brand new release following on from his top 40 summer track, ‘Boom Boom (Heartbeat)’ and the funk infused ‘Fireworks’. This time he joins forces on the production with Australian bassmaker, Tom Piper and Ayah Marar steps up on the vocal delivery following her collaboration with Calvin Harris on ‘Thinking About You’. Together the trio create this dynamic, bass heavy, synth infused track, topping it off with a heavy percussion filled backdrop. 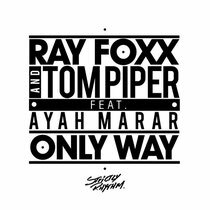 Ray Foxx first burst on to the scene in 2011 with ‘The Trumpeter’, later releasing vocal version ‘La Musica’, featuring Lovelle, which received support from Annie Mac, Trevor Nelson and Zane Lowe to name a few. Ray came back with ‘Boom Boom’ last summer which charted in the UK at number 12. The Foxx has been busy with recent remixes for Sigma and Dizzee Rascal, as well as providing a fortnightly guest mix for MistaJam on BBC 1Xtra, and hosting his own weekly show on Kiss FM’s digital station Kiss Fresh. Fellow producer Tom Piper is signed to Ministry Of Sound in Australia, and is possibly one of the most in demand DJs and producers in the Southern Hemisphere. He’s had collaborations with Tommy Trash, Micky Slim & Majestic and most recently his remix of Fatboy Slim & Riva Starr’s massive track ‘Eat Sleep Rave Repeat’ is currently at #1 on the Australian club chart. Dubbed the Queen of bass, Ayah Marar provides the lyrics on ‘Only Way’. Ayah has had collaborations with Calvin Harris, DJ Fresh, Drumsound & Bassline Smith and Toddla T to name a few, not to mention recent tours with Example, Camo & Krooked and Calvin Harris himself. Having been heavily involved in the D&B scene from a young age, Ayah is an established singer, DJ and MC. Her debut album ‘The Real’ was released in 2012, ‘The Raver’, one of the singles from the album, had a remix from the Foxx himself. It’s out on Strictly Rhythm on 16 March, check it out below.